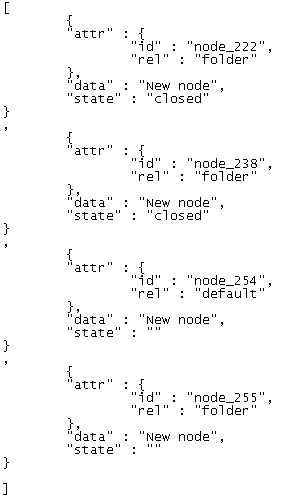 After installation of the Module for JSON format, 2 new functions appear in the list of WAPT internal functions: JPath and JSON Text. JPath is an internal function of WAPT. It is designed for server responses containing JSON and works on the same principle as XPath function. /node1/node2/Element[number] - this way we choose an element of array with the specified number. 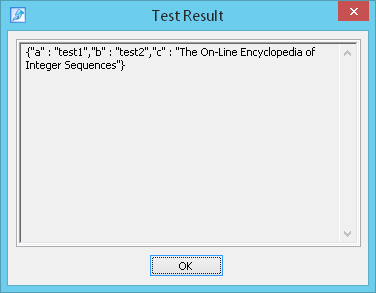 The sequence of embedded tags can be continued further - inside the specified element of array. There are no attributes for values in JSON, however they may be required in the XPath function. 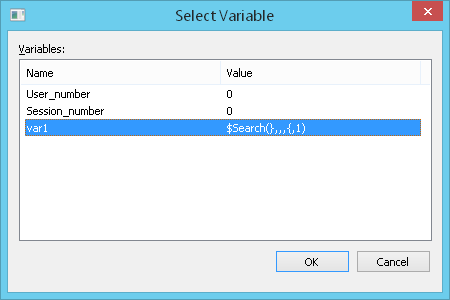 You will need this attribute when organizing a search, for example: find all nodes where the attribute type is equal to int. 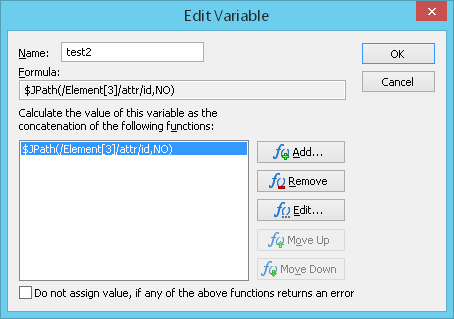 That is why we add an attribute type to values of properties. 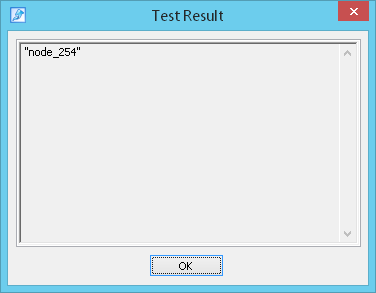 Attribute type is a single attribute of values which is added during the conversion of JSON to XML. 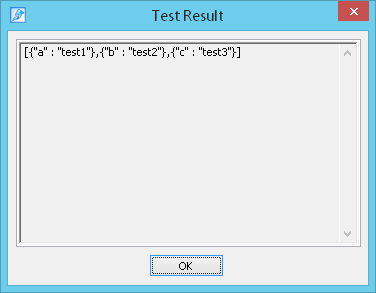 It can be equal to array, object, bool, string, double, int, uint, null depending on a value. 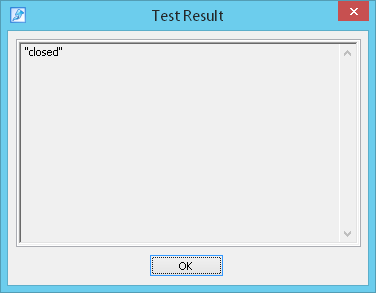 YES/NO indicates whether quotation marks " " must be deleted (YES) or not (NO) in the received value of this function. 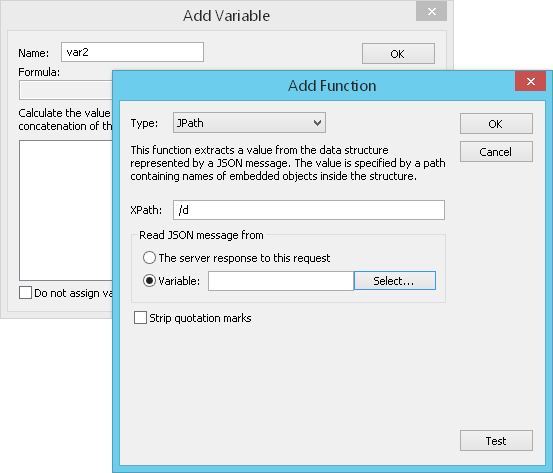 var-name is the name of variable which contains the extracted JSON (this parameter is optional). 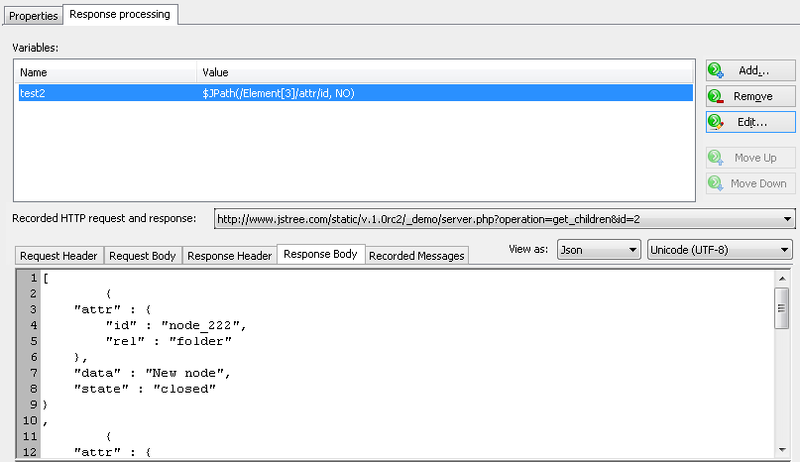 XPath: Here you should enter the sequence of opening tags that stand before a desired node. This sequence can contain variables. 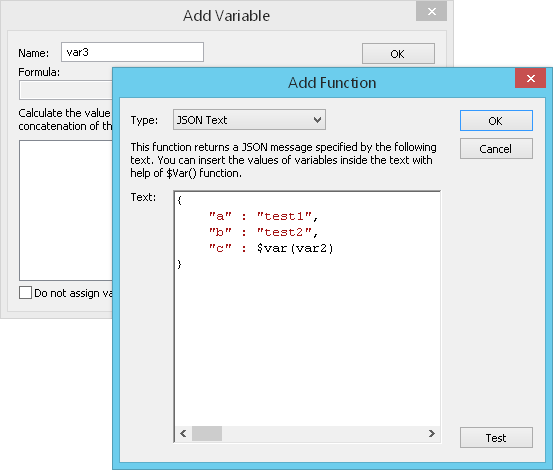 Use $Var(var-name) function to insert the necessary variables in the path expression. 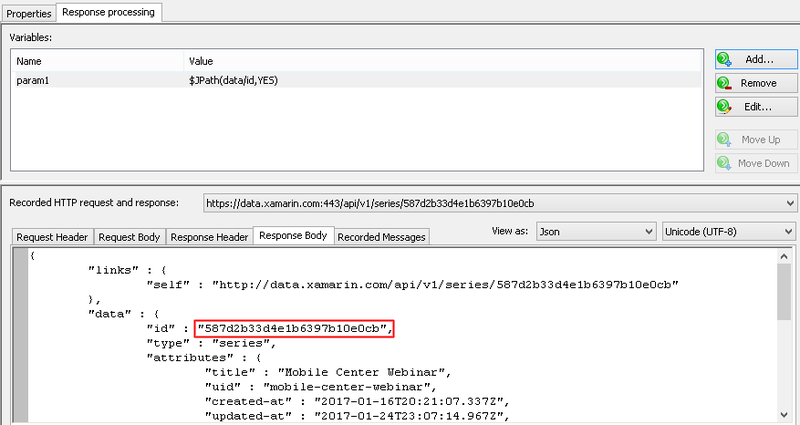 Enter the $ sign in the XPath field and you will see a prompt with the list of available variables (defined on the previous pages). Select a desired variable in the list to insert it in the path expression. It is recommended to write all names within the XPath string with the quotation marks " ", because $JPath accepts some symbols which are illegal for XML. 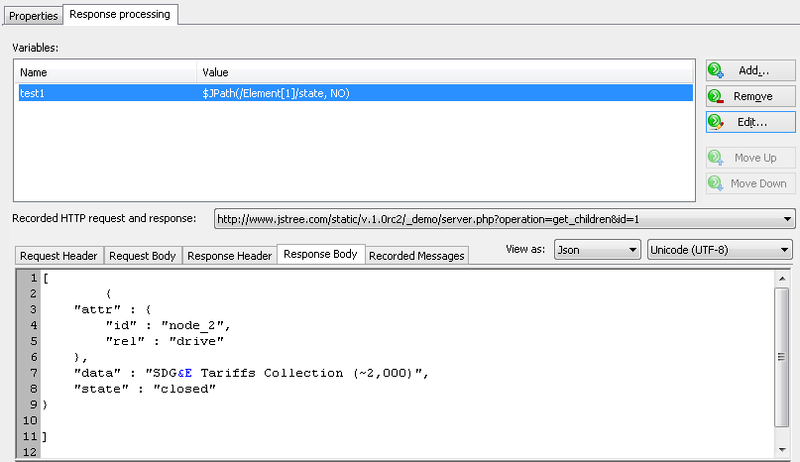 If the XPath string does not contain illegal characters, it will be processed without quotation marks. 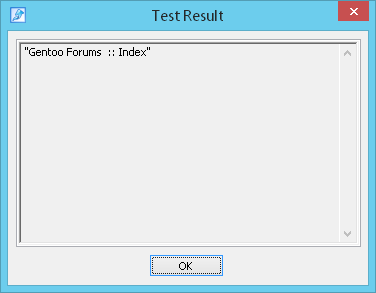 However, if it contains some symbol illegal for XML, then the function will not work without quotation marks. If you choose the option "Variable", you should click the Select... button and select the necessary variable in the list. Strip quotation marks: Removes quotation marks " " in the received value of this function. 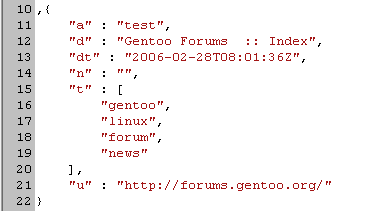 This example demonstrates the usage of the first JSON structure - an object. Here we extract the value of "id" from the JSON message of server response. 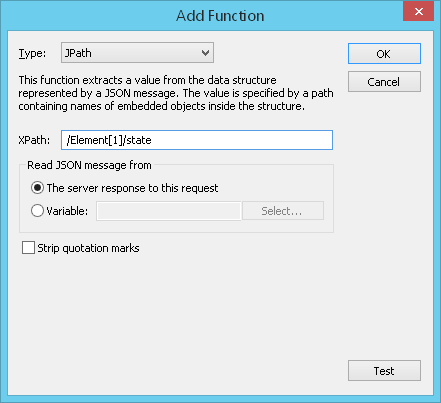 The following examples demonstrate the usage of the second JSON structure - array. In this example you can also see the usage of arrays in JSON code. 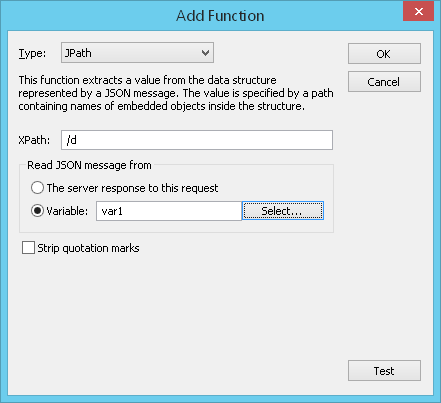 JSON Text function is similar to WAPT function Static text. 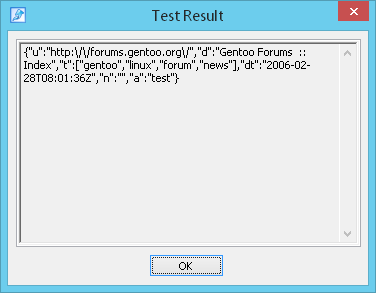 Both of them return the specified string of text. 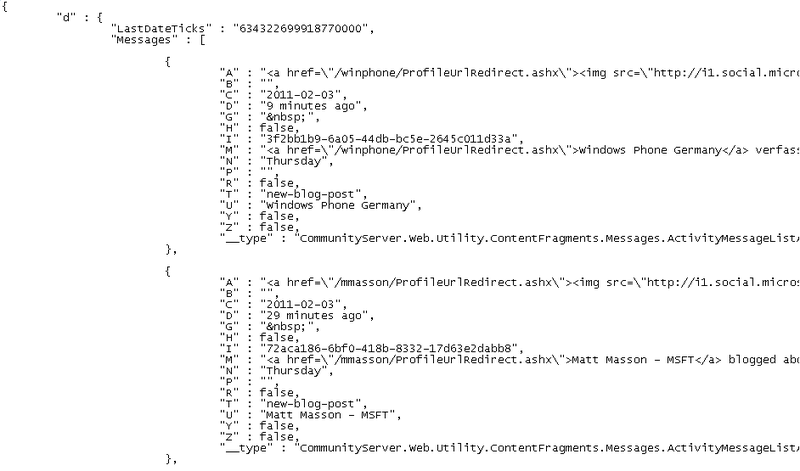 JSON Text function additionally supports the JSON formatting. 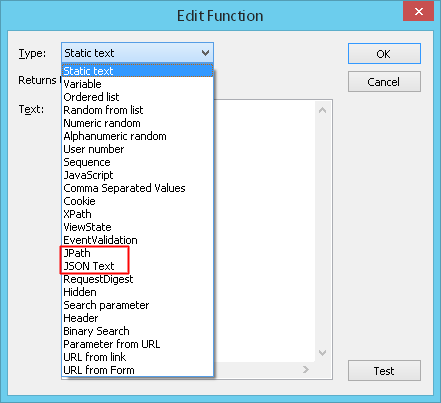 When you define this function, you should enter any valid JSON in the Text field. You can insert variables $Var(var-name) inside the entered text. After execution of this function, the text will contain the calculated values of these variables. 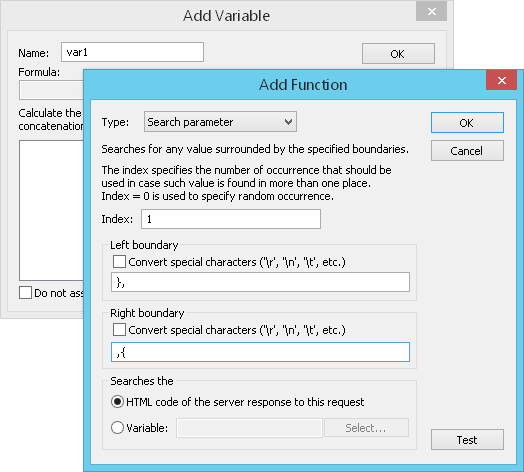 In this example we will show the usage of variables.